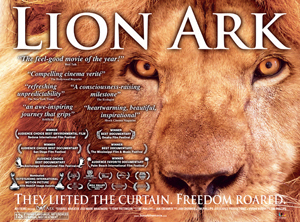 March 17, 2015, Evansville, IN – Lion Ark, a film about the dramatic rescue of 25 lions from circuses in Bolivia and their amazing journey to a sanctuary in Colorado, is screening at the Alhambra Theatre Film Festival. This will be one of the first US screenings since Lion Ark signed a worldwide distribution deal with ITV GE, who showcased the film at MIPCOM Cannes last year to global media markets. Lion Ark will have a selected US theatrical tour in April before being available on TV and Video On Demand. Described by critics as “uplifting” and “the feel-good movie of the year,” Lion Ark has taken the film festival circuit by storm winning eight awards at sell out screenings and securing an NAACP Image Award nomination for Outstanding International Motion Picture. Lion Ark is all live action and commentary, close up and personal, right in the thick of the rescue. As close as you get to these animals, understanding them and the effects of circus life. See the undercover investigations that changed a continent; the lobbying; the enforcement of the circus animal ban in Bolivia. Circuses that defy the new law are tracked down, animals saved, and a joyous finale sees 25 lions airlifted to freedom. Lion Ark Director Tim Phillips (ADI Vice President) and Producer Jan Creamer (ADI President) – who also led the ADI rescue team will be doing a Q&A following the screening. Both are flying up from Peru, where they are in the middle of another huge rescue which will see 33 lions rescued from circuses by ADI flown to The Wild Animal Sanctuary in Colorado. The LION ARK rescue was funded entirely by donations, including a significant gift from legendary US TV ‘Price is Right’ game show host Bob Barker. A similar operation – Spirit of Freedom – is now underway in Peru, where ADI is once again assisting the authorities to enforce its animal circus ban, having successfully secured the legislation. ADI currently has 33 lions, 33 monkeys and many other native wild animals at its temporary rescue center. Find out how you can help ADI with its Spirit of Freedom rescue mission.